Description: Professional paper for 100% cotton. 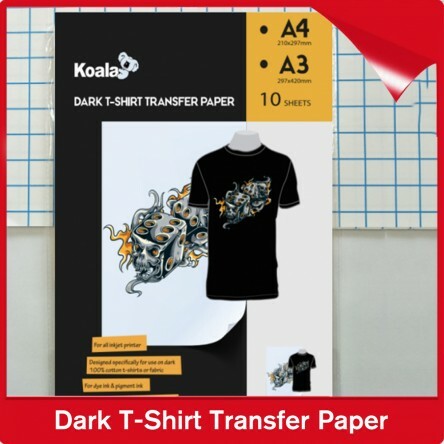 T-shirt paper can be divided into light transfer paper for light color cotton and dark transfer paper for dark color cotton. Mostly have the A4& A3 size. 1. Apply to all inkjet printer & pigment inks. 2. Used for 100% pure cotton textile. 6. Hot or cold peel off, for use with domes.tic iron or heat press. Q:What’s about the transfer rate of our sublimation paper? A:Transfer rate depends on the ink residue on the paper. Q:Which ink will be more suitable? A:Mainly is sublimation ink, normal inkjet printer ink is also available, but transfer effect is worse. Sublimation ink is the key of the whole transfer printing technology. Q:How to storage transfer paper? 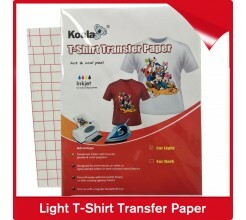 A:Transfer paper storage conditions: waterproof, fire prevention, avoid light, pay attention to seal when not in use. A: a. Preheat the iron to the setting of highest temperature for about 8-9minutes (about 180-200 degree) and take approx.2minutes. Do not use steam function. c. Briefly iron the fabric to ensure that it is completely smooth. d. Place the transfer film onto the textile with the printed image down towards on the fabric. e. Iron on the backside of the transfer film applying less pressure. Warm up the transfer evenly with slow circling movements from edge to edge and make sure that the heat is evenly transferred over the entire area. Don’t forget the corners and edges. g. To get the best transfer effect, we suggest you use heat press machine (temperature about 185 degrees), do not use stream function. h. To peel off the base paper once you finished ironing at once. Q:How to wash the T shirts? A: You must wait 24 hours before washing on the first time (drying time). Fabrics bearing our transfers are machine-washable up to 30 degree. Always wash garments inside out. Do not use aggressive washing detergents or bleach of any kind, do not tumble dry. Avoid ironing directly over the transferred motif, ironing form the backside of garment/fabric. To revitalize the color brilliance the transfer can be ironed again. Cover the picture again with the grease-proof paper, iron for a few seconds and peel the grease-proof paper off after cooling.